Last week came the news of Carnival Corp & plc’s new fathom brand and its project to introduce social-impact cruising. This week, while nothing outstrips fathom’s plans in sheer terms of scale, we look at other attempts, both in the past and now, to introduce something similar. Elsewhere, the Cruise Industry News Annual Report is now available so we take a quick look at how world cruise markets have fared in recent years. Finally, G Adventures has announced a new 38-day odyssey along South America’s west Coast in the spring of 2016. Reactions to the news of Carnival’s new fathom social-impact cruising product have pretty well petered out by now, as we all wait and see. After all, the first cruise will not leave Miami until April 2016. From last week’s column, you will know that fathom is aimed at taking cruisers to foreign countries for the purpose of improving the quality of life of local residents. The first country chosen is the Dominican Republic, where the new line’s Adonia will spend three nights a week docked at Carnival’s new Amber Cover terminal near Puerto Plata while passengers help out ashore. But going back, in the last century was the International Grenfell Association in northern Newfoundland and Labrador, where rich Americans volunteered and sent donations. The Cluetts of Cluett Peabody & Co (of “Arrow” shirt fame) donated a schooner to haul goods and supplies north to the Labrador coast. And in addition to cash contributions, Lord Strathcona, one of the founders of the Canadian Pacific Railway, provided the Mission with a small steam-powered hospital ship, the original of which had once been his private yacht. 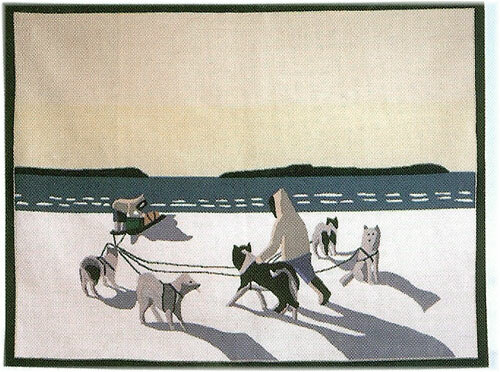 Among the many unpaid volunteers who worked in Labrador were names such as Cyrus Vance and Henry Cabot Lodge. Sir Wilfred Grenfell, the English doctor, who first arrived among the Labrador fishermen in 1892, was well known for having built hospitals and nursing stations and establishing co-operative stores, agricultural centres, libraries, schools and orphanages on that coast. He also made an annual cruise to all these posts in the Mission’s hospital ship. University students and volunteer nurses went to work amongst the fishermen and natives in the Mission’s various posts and hospitals. While they all arrived by ship, they did so only two or three at a time to each community, for the summer for the students, more often for a year for the nurses. But these volunteers did not arrive 600 or 700 at a time for just three days, as they will with fathom. Brothers Nelson and Laurance Rockefeller worked aboard a new Grenfell Mission ship, the Maraval, in 1929, and in 1930, cruise ships began calling at many of the Grenfell outposts. Their passengers assisted the local community by buying local handicrafts and hooked mats with fancy patterns that were made from old silk stockings contributed by lady supporters in the south. These voyages, known as Grenfell Labrador cruises, unfortunately vanished with the outbreak of the Second World War in the autumn of 1939. But while heavily themed, these cruises did not concentrate exclusively on the Grenfell Mission. Fathom will be the first line to be dedicated exclusively to this type of activity. The hedges are there, however. As well as being president of fathom, Tara Russell is now global impact lead for all of Carnival Corp & plc’s ten brands. And Sara Macefield of the UK’s Travel Trade Gazette managed to wheedle it out of Carnival Corp & plc chief executive Arnold Donald that the initial charter on the Adonia was for only six months, and that she was not actually leaving the P&O fleet. From a purely business point of view, if it is not possible to book 600 or 700 people every week, at what looks to be double the going cruise fare, there will no doubt be other ways for this project to go forward. For example, there is no reason that all the other nine Carnival brands could not include social-impact activities in their shore excursions. Crystal Cruises already offers so-called “You Care, We Care” shore excursions, giving guests the opportunity to make a difference in the places their ships visit on every itinerary where this is possible. These adventures, focusing on hands-on volunteer efforts ashore, are offered on a complimentary basis and without obligation to make donations. Meanwhile, in the Mediterranean, Corsica Ferries has come up with a novel idea of its own that has what you could call social impact. Through its “Corsica Sardinia Ferries Forest” program and with the help of 200,000 participating passengers, it has planted more than 32,000 trees in the region of Saint Martin in the Peruvian Amazon. So far, 160 local producers have planted twelve different varieties of tree in 164 different plots in the upper Amazon. The program was out into place not to make money, but to reduce the impact of CO2 emissions made by its ferries. Other maritime ventures that include activity a “social-impact” nature include Mercy Ships, which operates the world’s largest hospital ship and offers a volunteer abroad program, Semester at Sea, which offers long educational voyages that include some aspect of social impact activity in their trips ashore, and Peace Boat, a Japanese non-governmental humanitarian organization that charters ships for world cruises. The 16,672-ton Africa Mercy is presently in Durban and will next move to Taomasina in Madagascar next week, while, as reported last week, Semester at Sea will be taking delivery of its sixth ship, the 600-berth World Odyssey, ex-Deutschland, in August. The 1,022-berth Ocean Dream, meanwhile, is on Peace Boat’s 87th global voyage, which began in Yokohama on April 12. Built in 1981 as Carnival’s first new ship, the Tropicale, in 1981, she left Reykjavik last Wednesday for Curacao and is due to complete her present voyage in Kobe on July 26. 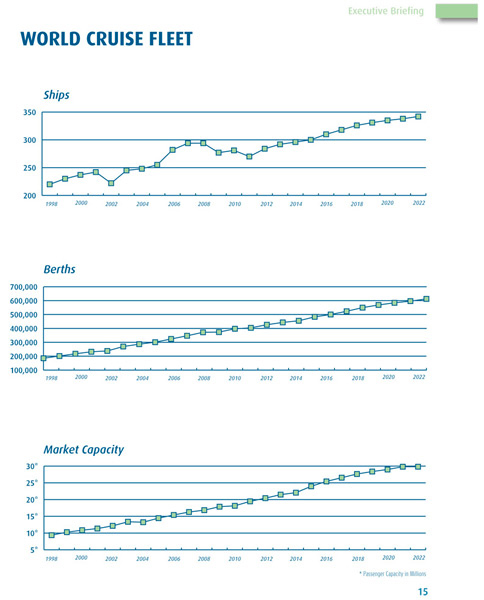 Cruise Industry News Annual Report, now available for 2014, contains some interesting statistics on world cruise market growth in recent years. Although the North American market grew by an estimated 23% from 2005 to 2014, from 9.6 million to 11.8 million passengers, it has seen no real growth for the past three years, partly because bad publicity for a couple of Carnival Cruise Line sailings in the United States put a damper on growth. Europe grew by 106%, or more than four times the rate of North America over the same ten-year period, going from 3.1 million to 6.4 million passengers. The Nordic countries grew most, with a 780% increase from 42,000 passengers to 370,000. The largest market, however, is Germany with 1.8 million cruisers, a growth of 180% over 10 years. The UK has meanwhile expanded by 53% from 1.1 million to 1.6 million. France has also grown by 254%, from 233,000 to 591,000. Despite showing strong growth over the ten-year period, Italy and Spain shrank last year. While expanding by 62% over ten years, 833,000 Italians cruised last year, compared to 860,000 the year before. Spain grew 51% over the same period, with 573,000 Spaniards cruising in 2014. This was down from 600,000 in 2013 and a high of 703,000 in 2010. The Asia-Pacific market, meanwhile, has grown by nearly 185 % over the last five years for which reliable records are available, from an estimated 530,000 passengers in 2010 to more than 1.5 million in 2014. The Australian market has grown from 158,000 passengers in 2005 to more than 1 million in 2014, giving it the largest market penetration in the world, greater than North America’s. At the other end, the biggest market decline has been in Brazil, which dropped to 640,000 passengers in 2014 from 732,000 the year before and a high of 780,000 in 2011. Nevertheless, the market grew 412% from 2005 to 2014. The Cruise Industry News Annual Report covers everything from new ships on order to supply and demand scenarios from 1987 through 2021 and after. There are also a future outlook, growth projections for each cruise line, regional market reports, and detailed ship deployment by region and market, covering all cruise lines. The report is available from Cruise Industry News for $895. G Adventures has announced a new 38-day voyage along South America’s west coast by the company’s 134-berth Expedition departing Ushuaia on March 21, 2016, and taking in twenty-one ports in six countries. These include Argentina, Chile, Peru, Ecuador, Panama and Colombia, where it finishes in Cartagena. Highlights of the trip include a three-day land-based visit to Machu Picchu, a visit to a Chilean rodeo and to the Copiapo mine where thirty-three Chilean miners were trapped underground for more than two months in 2010. Other optional trips include a flight over the ancient Nazca lines and the chance to traverse the Panama Canal. The 38-day (37-night) expedition includes a night in Ushuaia pre-cruise, 33 nights on board Expedition, three days included trip to Machu Picchu and the Sacred Valley. The voyage will also be available in shorter sectors.